You forgot kneel, There’s a bunch of kneel. All I know, is for some reason I love the communion wafers. 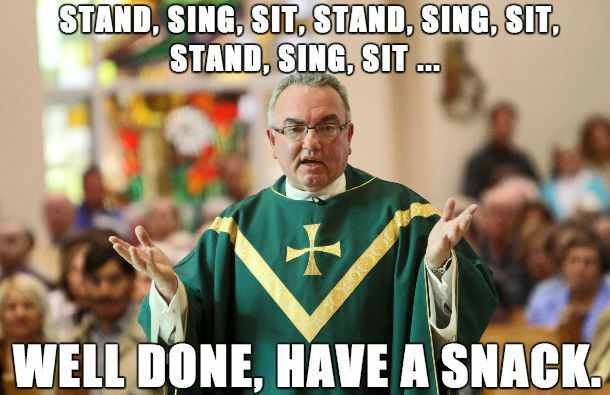 But yeah, this pretty much sums up Catholic Sunday mass. The snack is them EATING JESUS AND DRINKING HIS BLOOD!!! This is the literal belief in the Catholic church. It’s not a metaphor, that wafer literally turns into the epidermis/muscle tissue of a first-century Jew. Until a class In College I thought the wafer thong was a metaphor, which I thought was kinda cute. When I heard about transubstatiation I lost my “multicultural tolerance and respect” cool and giggled like a mean schoolgirl. It’s not too far off from Jewish services. Except the snacks are mostly afterward.